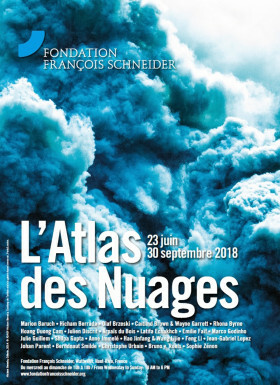 The International Cloud Atlas, published in 1896, was compiled thanks to the research and classification work conducted by researchers like Jean-Baptiste Lamarck, Luke Howard and Ralph Abercrombie. It was the first publication to set out a nomenclature for clouds, using Latin names, which allowed all European meteorologists to work together. This was how names like Cumulus, Stratus and Nimbus were applied to the different types of clouds, bearing witness to the establishment and recognition of meteorology in the 19th century. The theme of clouds has been present in iconography since Antiquity and has been a major source of inspiration over the centuries, particularly in painting and photography. Symbolic, poetic, threatening, divine… clouds have played a central role in artistic representation. In the 21st century, they continue to fascinate numerous artists, whilst environmental and political issues have also come into play. The Cloud Atlas takes an approach that is both playful and sensory, arousing the curiosity of a broad audience, as it takes us on a geographical, sociological and philosophical journey. The project encompasses the work of over twenty international artists, with photographs, daguerreotypes, neon works, lightbulb installations, videos, fabric sculptures, drawings and more. Anne Immelé’s cloud flags ask questions about borders, in the same way as Marco Godinho’s cloud stamps raise issues of migratory politics and the movement of people over the past decade. The cloud composed of 6,000 lightbulbs created by the collective of Caitlind Brown & Wayne Garett invites visitors to play with a tree of light. Pollution and smoke appear in the work of Christophe Urbain, whereas Hoang Duong Cam denounces the systems of Asia’s megacities. Berndnaut Smilde creates ephemeral clouds. And whilst Emilie Faïf sets hearts beating, they are pierced by Marion Baruch. Shilpa Gupta imprisons them or speaks to the sky. Julie Guillem and Jean Gabriel Lopez recreate their own cloud atlas using historic processes. Artist list : Marion Baruch, Hicham Berrada, Olaf Brzeski, Caitlind Brown & Wayne Garrett, Rhona Byrne, Hoang Duong Cam, Julien Discrit, Arpaïs du Bois, Latifa Echakhch, Emilie Faïf, Marco Godinho, Julie Guillem, Shilpa Gupta, Anne Immelé, Hao Jinfang & Wang Lijie, Feng Li, Jean-Gabriel Lopez, Johan Parent, Berndnaut Smilde, Christophe Urbain, Bruno v. Roels, Sophie Zénon.